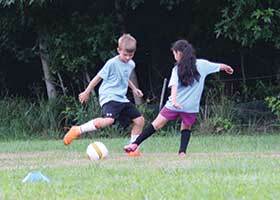 Universal Soccer Academy has been conducting Summer Camps since 2000. Every summer both local and international students join our camps looking to improve their game. Our camps run for 12 hours and give our students the opportunity to improve their entire game. Champions Camp is a 12-hour training program spanning four days. In this Summer Camp, students will work on refining and improving their individual technical skills and their game awareness through tactical games. Also, players in this camp will learn about the at-home habits needed to become an effective soccer player in a seminar setting. Parents are invited to this portion of the program. The goal of this camp is to provide a training environment that gives students the opportunity to work on a wide range of ball-handling skills through activities that maximize touches. Tactically, the camp is intended to enhance our students' movements without the ball through small sided games. Psychologically, our goal is to give students an insight into the training habits needed to be successful. Joining the Champions Camp will give you the opportunity to sharpen your skills and improve your overall game significantly through our 5 Pillars Methodology. On a daily basis, our student starts the day by improving their Individual Skills before moving onto micro games specifically designed to enhance their off the ball movement. Each day ends with shooting activities that give our students the opportunity to become effective when in goal range. 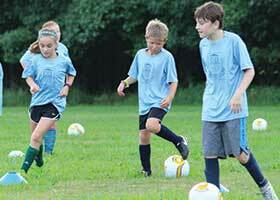 Soccer Star Camp is designed for players looking to improve the attacking aspect of their game. Creating goal opportunities and scoring requires excellent distribution and finishing skills. In this Summer Camp, students learn to utilize a variety of passes and to score goals with precisions and accuracy. The goal of this camp is to give our students the opportunity to become creative when in possession of the ball and to become clinical scorers of goals when in and around the goal. On each day of this Summer Camp students learn how and when to execute chips properly, benders, stabs, scoops, and driven passes. They also learn how to finish those scoring opportunities with lace-driven shots, benders, volleys, and chips. We have compiled a list of commonly asked questions and provided answers. If there is a question you do not see on the list, contact us!